After initial pathological assessment by punch or excisional biopsy, the next step is treatment of the primary site and staging of the regional lymph nodes. Treatment for the primary tumor consists of wide local excision. Local recurrence can be as high as 40% for primary melanomas that are not reexcised after biopsy (3). Melanoma-in-situ is treated by reexcision with at least 0.5-cm margins around the primary lesion or biopsy scar. When primary invasive melanomas are <1 mm thick or Clark's level II, adequate margins are 1 cm circumferentially. Melanomas that are 1.0 to 4 mm thick or extend to Clark's level III/ IV are treated with 2-cm margins circumferentially. Because of the increased risk of microsatellites, melanomas thicker than 4 mm or extending to Clark's level V should be excised with 2- to 3-cm margins that include the underlying fascia (3). 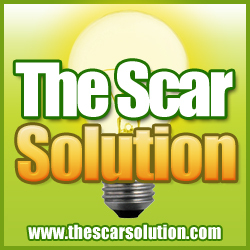 Wound closure is achieved primarily with local flaps or more rarely with skin grafting. Some primary sites have special considerations. On areas of the face such as the nose, eyelids, and lips, where wide margins may cause significant morbidity, 1.0- to 2.0-cm margins are attempted. Moh's micrographic surgery has been performed for thin facial melanomas, but there is little long-term data on its efficacy. Melanoma on the helix of the ear is controlled with a wedge excision to permit cosmetic reconstruction. Primary melanomas thinner than 0.75 mm, nonulcerated, and without signs of regression are generally treated by wide local excision of the primary site alone. Patients with deeper primary lesions (Breslow depth > 1 mm or Clark's level IV/V), worrisome signs such as regression or ulceration, or incomplete biopsy with a positive deep margin, should undergo wide local excision with appropriate margins and staging with SNB. SNB for melanoma was first described in 1990 by Morton, et al. as a way to obtain prognostic information about the spread of a primary melanoma and to avoid the morbidity of elective dissection for patients with no evidence of lymph node involvement on physical exam (10). Part of the American Joint Committee on Cancer (AJCC) staging of melanoma, SNB is now a standard of care, and, therefore, should be a routine part of the treatment offered patients with at-risk lesions. SNB is usually performed in conjunction with wide local excision of the primary lesion. Prior to SNB, lymphoscintigraphy is used to map the nodal drainage from the primary melanoma site. This is performed preoperatively by injecting 300 to 1000 mCi of technetium-99m (Tc-99m) sulfur colloid intradermally around the primary biopsy site. Sequential images are then obtained to track the lymphatic drainage (Fig. 2A). Areas of increased radioactivity are confirmed with hand-held gamma probe and marked on the patient's skin (Fig. 2B). Lymphoscintigrams for primary lesions on the head and neck require interpretation by an experienced nuclear medicine physician, because drainage patterns in these lesions can be unexpected. Head and neck primaries drain to a mean of 2.5 sentinel lymph nodes (SLNs), requiring diligent tracking (6). The amount of Tc-99m sulfur colloid injected should be decreased in primaries overlying or directly adjacent to nodal basins, so that excess radioactivity does not result in "shine through" activity that obscures the SLN (5,11). After lymphoscintigraphy, the patient is taken to the operating room and positioned to allow access to both primary and SLN sites. Approximately 0.5 mL of isosulfan blue dye is injected intradermally around the primary site (Fig. 2C). The primary site is then gently massaged for one to two minutes. The nodal drainage site marked by prior lympho-scintigraphy is confirmed with hand-held gamma probe and an incision is made over this area. Dissection is guided by the increased counts over background and blue lymphatic tracts, until a blue-stained and radioactive SLN is found (Fig. 2D). All SLNs seen on the lymphoscintigram should be biopsied in order to provide complete staging. Each SLN is bisected and then examined by hematoxylin and eosin and by immunoperoxidase staining. Patients whose SLNs contain melanoma usually undergo completion lymph node dissection of the involved basin. FIGURE 2 Treatment of primary melanoma. (A) Lymphoscintigraphy showing draining solitary sentinel lymph node. 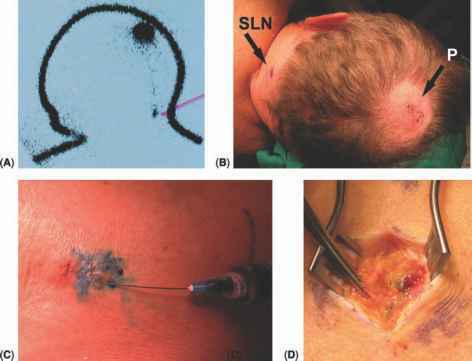 (B) Large pigmented primary (P) scalp melanoma (note healed central biopsy scar) with patient positioned laterally and sentinel node (SLN) marked on skin. (C) Injection of isosulfan blue dye intradermally around primary site. (D) Dissection over area with elevated counts reveals a radioactive, blue sentinel node with blue lymphatic tract. Source: Courtesy of Dr. Mark Faries. survival, but no overall survival benefit compared to observation (12). Unfortunately, many patients cannot tolerate the toxicity of this treatment. Trials using low-dose interferon-a-2b have shown no difference in relapse-free or overall survival, and other forms of biotherapy and melanoma vaccines are being investigated.